Now that you’ve chosen the perfect light fixture for your deck, you may be wondering what type of bulb is right for you. Incandescent bulbs are light on your wallet with their low pricing. They even come in many different shapes and wattages. These types of bulbs also emit softer and warmer lighting than LEDs. A downside to incandescent bulbs is that they only last for about 1,000-2,000 hours of use. Another disadvantage is that 95% of the energy they absorb is released as heat. Not only are they wasting energy, but it will cost you more money in the long run, since you have to replace them more often. Unlike Incandescent bulbs, LEDs have a much longer lifespan, ranging from 10,000 to 100,000 hours of use. LED bulbs do not burn out, but dim over time. This means that your bulbs can last roughly 400 to 4,000 days, or 1 to 11 years! If you do not use mirrors or reflective surfaces, the light emitted focuses in one direction and therefore might not be as warm on your eyes at night. Another drawback is that LED bulbs are more expensive because you pay for the bulb, the housing and the electric circuit. Despite the initial cost, many people choose LED bulbs because they value the environmental benefits and the long-term savings. Whether you choose LED bulbs or Incandescent bulbs, make sure that they are covered. You should also purchase extra bulbs so you have back up, should you need them. Check out our deck lighting page to see your available options. 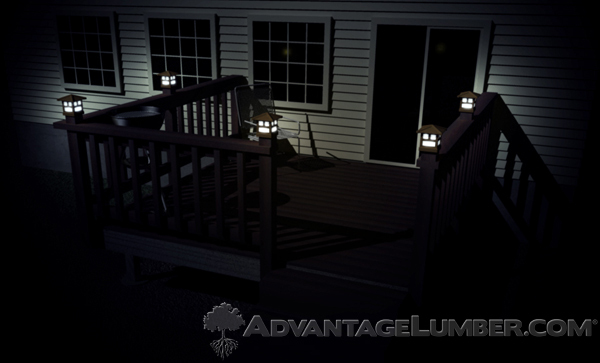 This entry was posted in Deck Lighting, Decking Installation, How-to Build and tagged deck light bulbs, deck lighting, led deck lighting on August 6, 2013 by Mr. Ipe Hardwood.